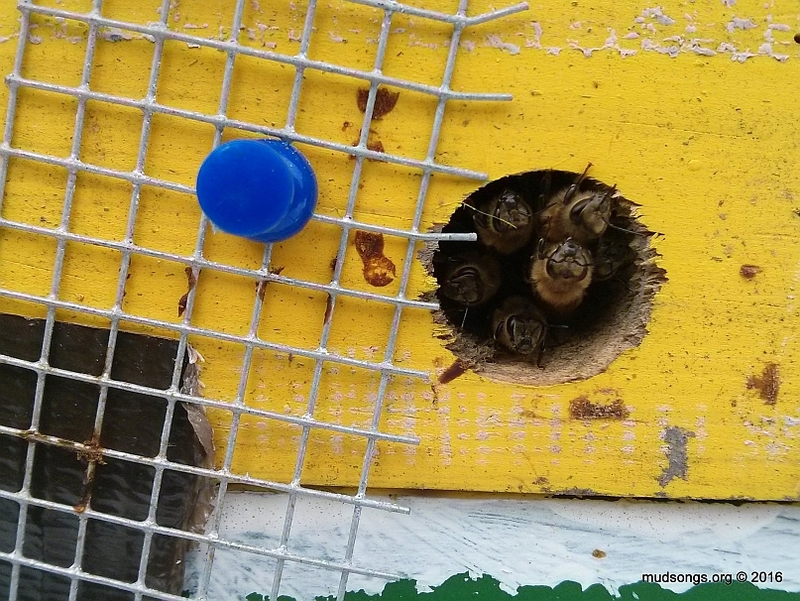 It was 18°C / 64°F today and the bees in all of my hives — even with shrew-proofing 6mm / quarter-inch mesh covering all the entrances — were out in full force. I’ve heard arguments that the bees can’t get through quarter-inch mesh. But that’s not true. If it was, my bees would have been locked inside their hives behind the mesh all last winter. 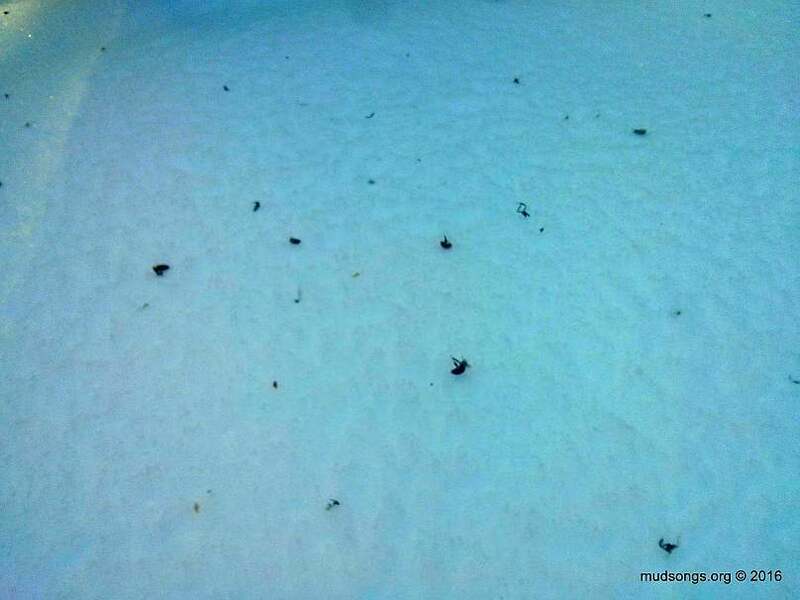 The bees in the above photograph wouldn’t be flying around today. The following was originally posted on December 7th, 2015, but was edited and updated on October 27th, 2016, to reflect my current practices, such as they are, and could be updated without noticed at any time in the future. Something weird happened. I got several emails from people asking me what I do to prepare my hives for winter. 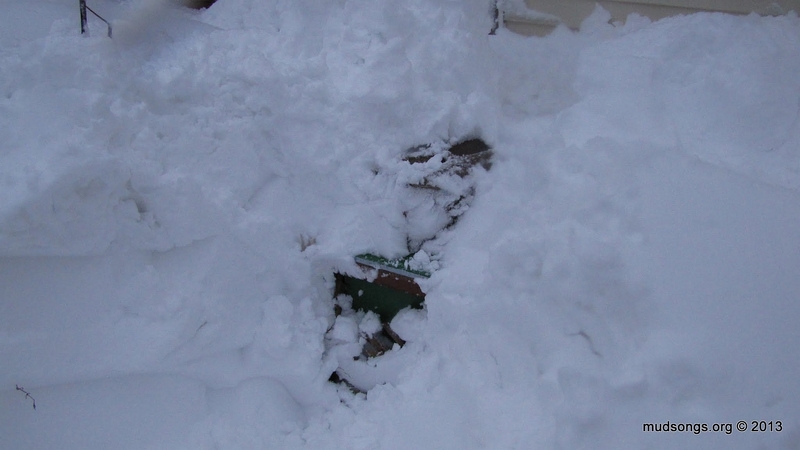 One of my bee hives after a snow storm in 2013. The bees survived. I’m no expert, but here’s what I do, and what I do could change entirely by this time next week. 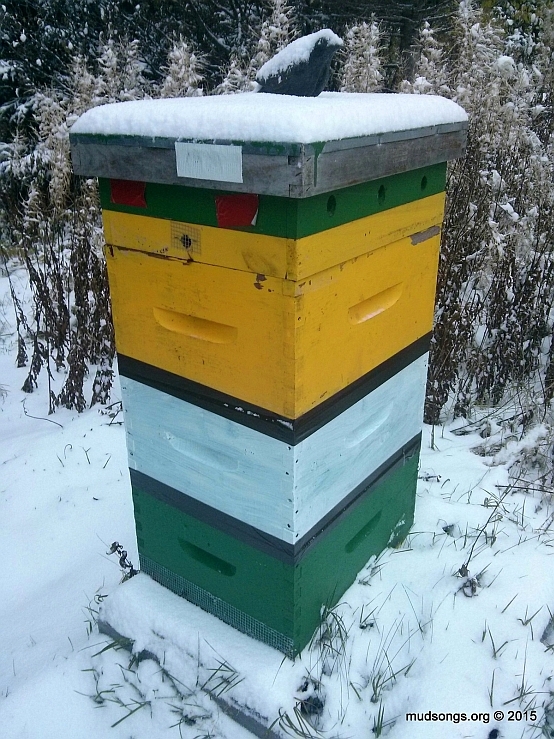 I used 6mm mesh (quarter-inch mesh) on my hives this winter for the first time because I lost most of my colonies last winter when shrews managed to squeeze through the half-inch mesh I kept on the bottom entrances. I’m not sure if the shrews got into the hives through the top entrances, but to be safe this winter, I covered both the top and bottom entrances with 6mm mesh. Now I’m wondering when I should remove the mesh, at least from the top entrances. 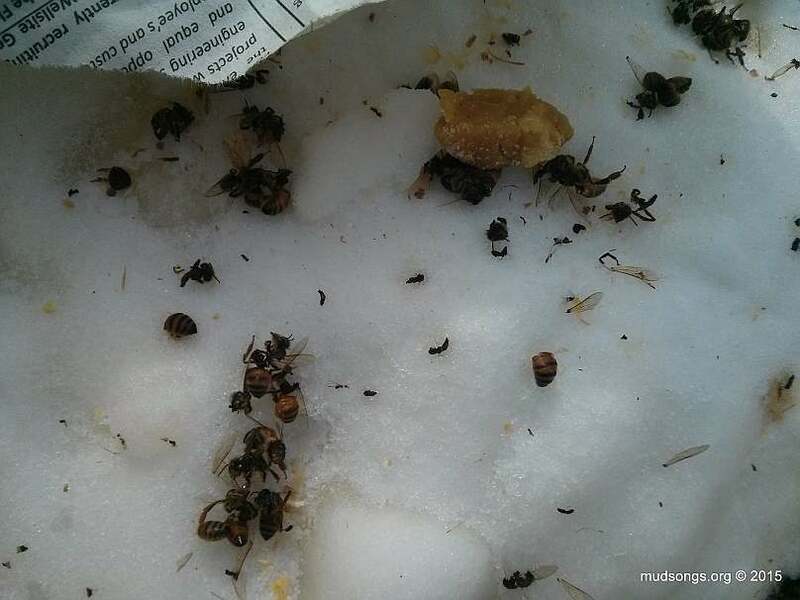 I found bee body parts scattered all over the snow near my hives today. “Ah man, what the hell is this?” was my first reaction. It was a natural reaction considering the last time I saw bee body parts was inside one of my hives last February — when shrews preyed on most of my bees until they were dead. 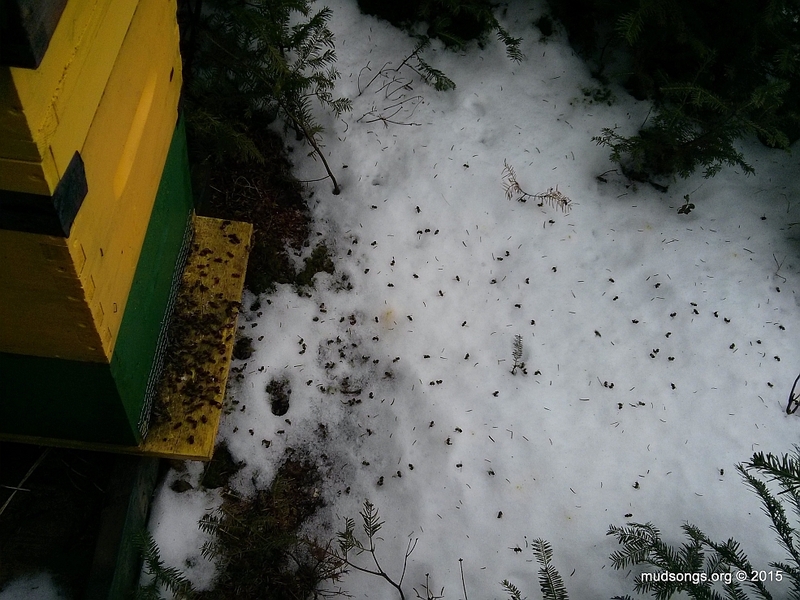 I had eight honey bee colonies going into winter last year (2014) and all but two of them were destroyed by shrews. The shrews squeezed through the half-inch mesh I’d been using since 2010 to keep mice out. But no one ever told me about shrews. The little buggers easily squeeze through half-inch mesh. They slip inside and pluck one bee at a time from the edge of the cluster. They eat the bee’s innards, toss away the bits of legs and other desiccated body parts, then climb towards the cluster for more… until they eat approximately 125% of their body weight in bees every day, gradually reducing the size of the cluster until the colony is dead. That’s how I lost six colonies last year. With only one mated queen and no extra brood, I performed a miracle and managed to expand my remaining two colonies into five colonies last summer. They may not be the strongest colonies I’ve ever seen, but they’re hanging in there (so far). All of my hives have quarter-inch mesh covering every entrance now. Shrews will never get anywhere near my bees again.